In villages all over Hungary you'll find cube houses—more or less identical in shape but painted in fantastical colors by their residents. While these houses may look utterly delightful and whimsical to our eyes, they're less welcomed in their own communities. In her book Hungarian Cubes, photographer Katharina Roters tells the story of standardized housing in Hungary. This standardized style of cubes first emerged in the 1920s, but they are most identified with the post-war communist era. 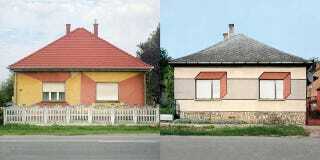 Their colorful facades were improvised by residents to spice up their otherwise drab dwellings. The houses have since become known as Kádár cubes, so named for former communist leader János Kádár whose legacy has been decidedly mixed. Roters writes that the houses are now seen with "mixture of disregard and hostility" and their colorful decorations as "slapdash, kitsch potpourri." For their current residents, the cube houses are also just outdated. The houses are being torn down or renovated, their striking geometric patterns plastered over. It's the old making way for the modern. But seen another way, the walls of these houses are an expression of individuality—a dash of color against the humdrum of standardization. Roters, who moved from a larger German city to a small Hungarian village in 2003, wanted to capture what she calls the "absurd beauty" of these houses. For more of her photographs, see her book Hungarian Cubes.